Our family really enjoys vegetable gardening. We started adding the vegetable gardens and the fruit trees and bushes. Next came the flowers. The rule in our house is that if you ask first, then you can pick it. We garden FOR the kids and although it is really nice to look out the window and see lots of blossoms, the joy in my children’s faces when making their own bouquets is priceless. 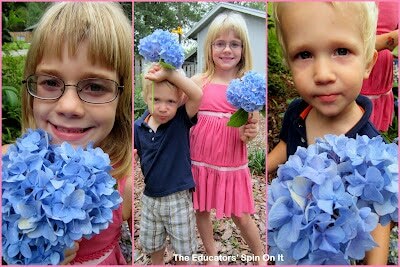 Kim just posted about an amazing field trip you can organize with the kids to a flower shop! If you have some flowers in your gardens, you could organize your own kid version of a flower shop after visiting the real one! Although we are just getting started with flower gardening, it is definitely a lot of fun. The pictures in this post were all taken in our gardens yesterday. We plant different flowers for different reasons. In MN, I grew up with huge bouquets of lilacs on the kitchen table. In my opinion, nothing replaces the beauty and smell of these flowers. If you can grow them, DO IT! Here in the South, we grow hydrangeas. I like having a BIG flower that the kids can easily put into vases for a beautiful display. Both the lilacs and the hydrangeas have very thick stems and need an adult to cut. This flower is an annual that was given to us by a neighbor. 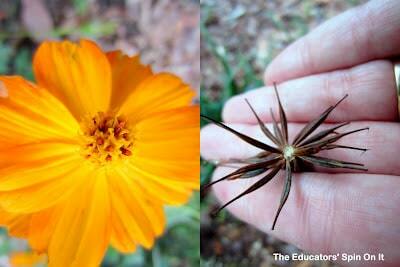 It wilts quickly when cut and has very thin wispy stems. 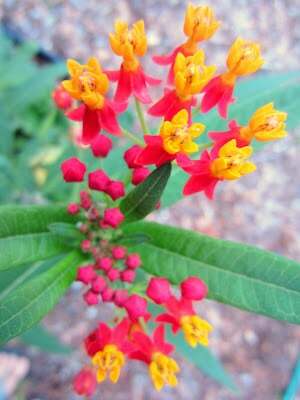 BUT, it is a bright colorful display of oranges and has the most fantastic seeds to collect, save, and re-plant. Marigolds and zinnias are also great for this too! 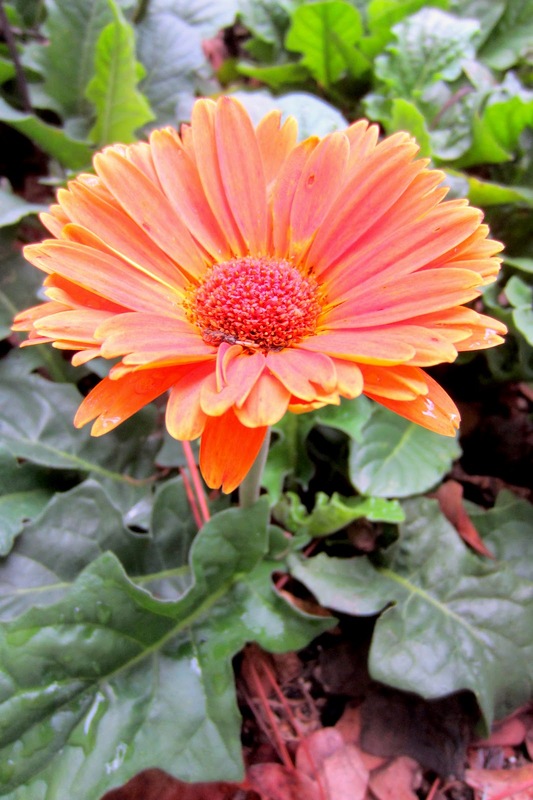 The Gerber Daisy is by far my most favorite plant for the kids. In our zone it is a perennial and I have been able to divide the 2 plants we started with into 12. 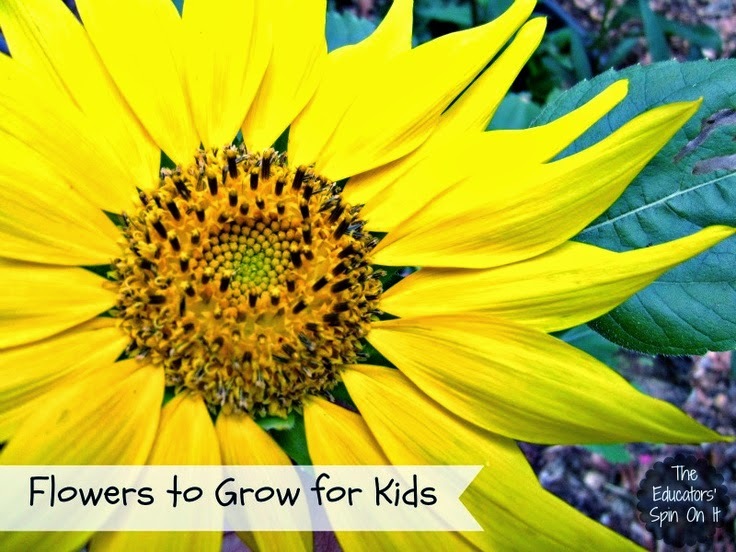 The stems are sturdy, but easy to cut and the kids can harvest them on their own(with adult supervision of course) They then can be put in a flower arrangement on their own or with other flowers. Their bright colors are fantastic! We also enjoy Zinnias, Snapdragons, and Mumms for harvesting and arranging too. The milkweed plant is one of our favorite annuals to grow. (We also save the seeds and replant each year) It is not great for making bouquets, but fantastic at attracting Monarch butterflies to our yard. We often have many caterpillars on our milkweed plants. When planting any flowers from seeds, we start way more than we really want, because inevitably, we get less than the amount of seeds we planted. The squirrels really like the sunflower seeds and we end up with a lot less than we started with. This year, all of our Giant Sunflowers failed to grow, but we have still been able to enjoy some smaller ones! What flowers do you enjoy in your gardens? Thanks for stopping by the Educators’ Spin On It, where we blog about all things parenting; reading, gardening, learning another language, cooking with kids, and MUCH, MUCH more! For more KIDS in the GARDEN posts click here – We believe that children should be outside interacting with their natural world. This is a parenting with purpose choice! 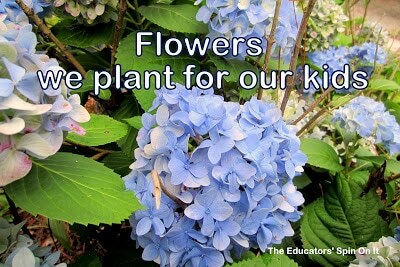 For our gardening journal and other kids in the garden items for purchase, please visit our Teachers Notebook page. « Let’s Go to the Florist! You have to add nasturtiums to your list they are pretty, edible, seed collection is fun and easy and they grow so quickly and are super hardy. They are definitely my kiddos favorite! There's something about sunflowers that really makes my garden bloom with life. I think it's how nature designed them. When I learned that the sunflower isn't exactly what it seems, I became a fan! Those little beads at the center are actually the real flowers called "florets." Those florets are too small to be seen, so nature devised a way to make them more attractive to insects. The outer florets each produce a vibrant petal which resembles our depiction of the individual rays of the sun, hence the name. Amazing, isn't it? And the daisies that your children love actually belong to the same family of the sunflower. We planted a climbing nasturtium last week – thanks for the suggestion. I can't wait to eat them! Thanks! I love learning more about flowers!!! I agree! My wee one is only 5 months old, but LOVES being out in the garden with us!!!! Oh, I so hope that they will continue to enjoy gardening their whole lives! And that it teaches them that good things are worth waiting for!!! Wow! Just beautiful flowers! I am not much of a green thumb when it comes to flowers, other than my lilac bush which I absolutely love. Thanks for sharing at the Discover & Explore linky this past week.